Whether you're a novice programmer learning how to program or a seasoned expert looking for a quick rapid-prototyping development environment, Arduino and CircuitPython can be a great choice for programming environments/languages. Pairing those simple programming languages with a powerful microcontroller, like the nRF52840 takes them to an entirely new level -- a level with Bluetooth capability! In this tutorial we'll demonstrate how to equip your nRF52840 and development computer with the firmware and software required to develop in either Arduino or CircuitPython. Both of these languages support digital I/O in/out, analog inputs, serial buses, and, most key to the nRF52840, support for Bluetooth Low Energy (BLE). We'll be mostly focusing on using these programming tools on the SparkFun Pro nRF52840 Mini, but any other nRF52840 should be adaptable. The only caveat is the Adafruit nRF52840 Bootloader should be installed on the nRF52840. If you haven't read through it already, we recommend following along with our SparkFun Pro nRF52840 Mini Hookup Guide before continuing on. This tutorial will familiarize you with the hardware features of the board as well as the intricacies of the DFU/UF2 bootloader. With the Arduino Board Manager, installing new board support within your Arduino IDE is a breeze! There will be one extra step to install the recommended support for the SparkFun Pro nRF52840 Mini, however. Adafruit, who have done an amazing job developing their nRF52 Arduino core for the nRF52832, have been extending their support to the nRF52840. In the "Additional Board Manager URL" box, add https://www.adafruit.com/package_adafruit_index.json. Go to Tools > Board and select the Board Manager. Search for "nRF", and you should find the Adafruit nRF52 board package. Having a hard time seeing? Click the image for a closer look. Installation may take a few minutes -- included in the install are all necessary source files for the Arduino core and nRF52 libraries, plus all of the compiler and software-upload tools you'll need to use the nRF52840 with Arduino. Once the board definitions have been installed, you should see a new set of nRF52 boards under your Tools > Board menu. 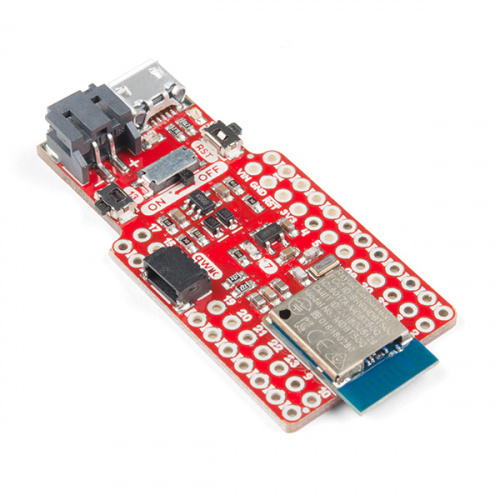 You won't, however, see an option for the SparkFun Pro nRF52840 Mini. For that, we need to manually add a new board. To add a "SparkFun Pro nRF52840 Mini" option to the nRF52 boards list, we need to make a couple small, manual modifications to the Arduino core you just installed. Why the SparkFun Pro nRF52840 Mini board definitions? I2C to pins to 8 (SDA) and 11 (SCL). Important if you're using the qwiic connector. SPI to pins 31 (MISO), 3 (MOSI), 30 (SCK) – again matches the Arduino Pro Mini pinout. If you'd rather skip this step – even temporarily you can use Adafruit Bluefruit on nRF52840DK PCA10056 as your board selection. If you installed the core manually into your Arduino sketchbook, it'll be in "hardware/adafruit/nrf52". Then copy the contents of the "variants" folder in this directory into the "variants" folder of the original directory. 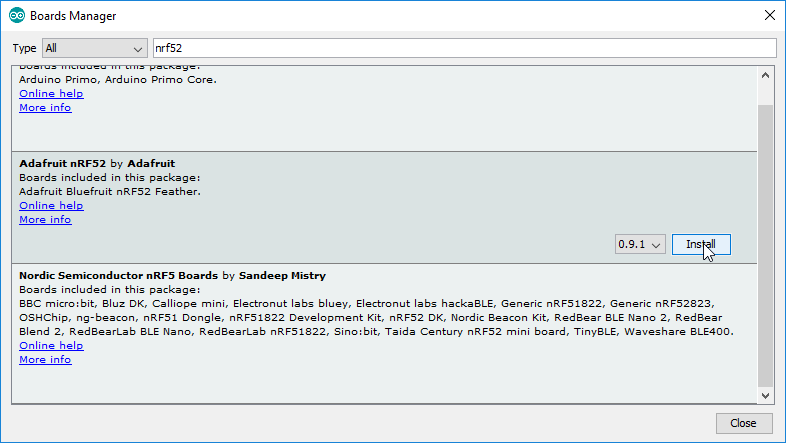 Nothing should be overwritten, but a new "sparkfun_nrf52840_mini" directory should be added in. After making these modifications, restart the Arduino IDE if it was open. A program called adafruit-nrfutil is used to package and upload compiled code to the nRF52840 -- similar to what avrdude does for Arduino Uno's and other AVR boards. If you're on a Windows or Mac machine, you can ignore this part. adafruit-nrfutil is automatically installed with the board definitions. Using the Arduino nRF52 cores, you can program digitalWrite I/O, analogRead ADC pins, Serial print to the Serial monitor, interact with hardware serial using Serial1, and even perform more complex I2C or SPI writes with the Wire and SPI libraries. But, if you've done any Arduino development before, those may not be all that exciting. Let's do some Bluetooth stuff! The nRF52 Arduino core includes the Bluefruit nRF52 Libraries which can be used to turn your nRF52840 into a BLE peripheral and/or central device. Browse the exhaustive list of examples by navigating to File > Examples > Adafruit Bluefruit nRF52 Libraries. One suggestion, if you want to start simple, is the peripheral/blinky_ota example. As if you don't already have enough examples, we wanted to provide a simple example that demonstrates how to control and interact with the nRF52840's hardware components over a BLE connection. This example allows you to toggle the LED and read the pin-13 button status using a BLE app on your mobile phone. *  status of the button. // the connection LED on pin 7. Before uploading, make sure you've selected SparkFun Pro nRF52840 as your board (or "Adafruit Bluefruit on nRF52840DK PCA10056" if you didn't install the SparkFun board definition. To test this example sketch, you'll need another device -- either computer or smartphone -- connected to your nRF52840. Nordic provides a free, handy test tool, nRF Connect for Mobile, that's available for both Android or iOS. We'll demonstrate how to control your nRF52840's LED and monitor the button using this sketch. So go download the app! Once downloaded, open the app and begin searching for nearby Bluetooth devices. Among those with a strong signal strength, you should see SparkFun_nRF52840. Click the "CONNECT" button next to that. Once connected, click on the Nordic UART Service, where you'll be presented with a pair of characteristics: TX and RX. Contrary to what you might expect, the "TX" characteristic is used to read the button status, and "RX" writes to the LED. To read the button state, click the triple-down-arrow icon to the right of the "TX" characteristic. This will subscribe to notifications. If you press and release the button, you should see the "Value" change from 0x00 to 0x01 and back. To write to the LED, click the up-arrow on the "RX" characteristic. Select "Text" as your format. Then write either "0" or "1" into the text box and press "SEND". A "0" will turn the LED off and a "1" will turn it on. Check out the code comments to see how the bleuart service is used to control these two characteristics. And check out the rest of the examples in the Bluefruit for nRF52 library! There's some great stuff in there! Are you looking for an escape from C/C++ or Arduino? Want to turn your nRF52840 into a Python-interpreting wonder? Check out the nRF port of CircuitPython! Please note that development on the CircuitPython port for the nRF52840 is still in very early stages of development. You're part of something exciting, but things might not always work as expected. 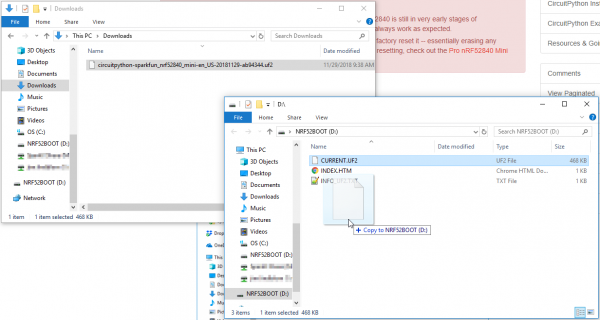 If you ever find your nRF52840 in an unknown state, you can always factory reset it -- essentially erasing any application and preserving the bootloader. For instructions on factory resetting, check out the Pro nRF52840 Mini Hookup Guide. The nRF52840's UF2 bootloader, which presents a drag-and-drop, USB mass-storage-device-based programming interface, can be used to flash CircuitPython onto your board. To begin, download our latest release of the CircuitPython firmware. It's packaged as a .UF2 file. 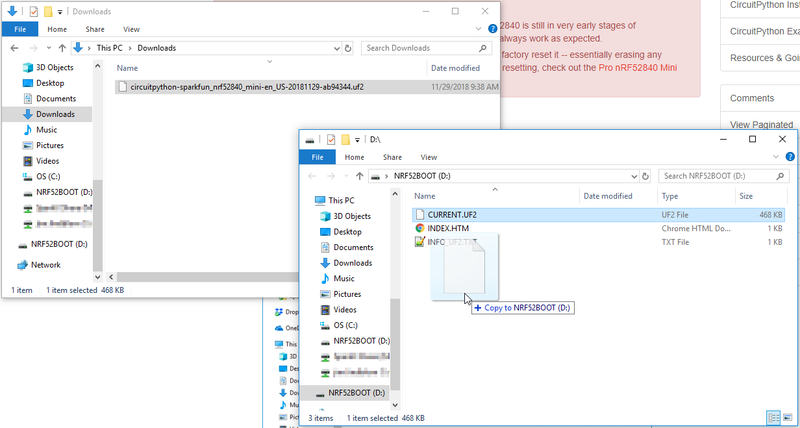 Next put your nRF52840 Mini into bootload mode. Either double-tap the reset button, or hold pin-13 down while tapping the reset button. 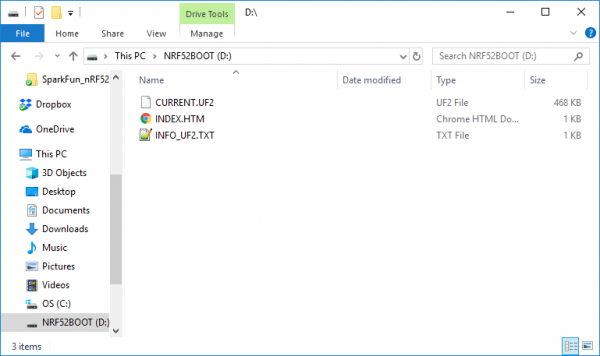 Your computer should find an "NRF52BOOT" device that looks like a removable USB drive. 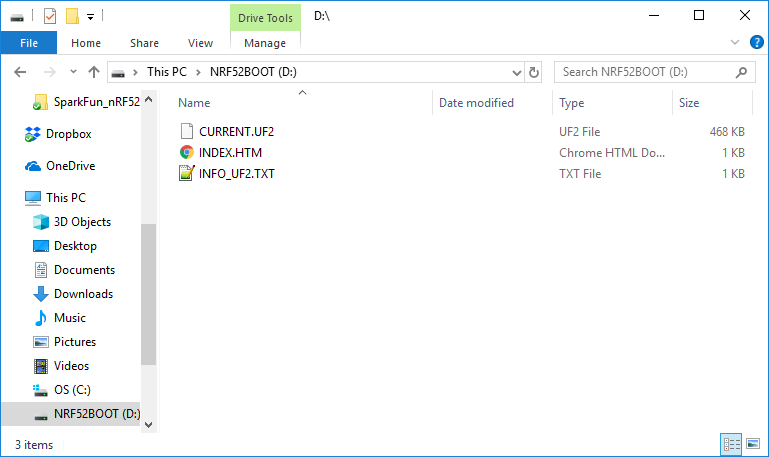 Now simply drag the UF2 file onto NRF52BOOT. After the file copies over, you may get a warning indicating that the file is too large -- this should be safe to ignore (hit "Cancel"). After the firmware is programmed, a new drive should pop up on your computer: CIRCUITPY. Just as you programmed the firmware on, you'll drag-and-drop Python files into this folder to run new applications. Then create a new file named code.py and paste the above code into it. (Or you can download blinky.py and rename it "code.py" if you prefer.) Note that CircuitPython is expecting a Python file explicitly named "code.py" for its Python application. If your file is named something else, it won't run. After the file loads, you should be presented with that comforting blinking light. Want to change up the time delay? Feel free to edit the "code.py" script directly on the CIRCUITPY drive. After you save, it should reload the script and run it anew. After saving that, you should be able to toggle the LED by tapping the pin 13 button. As noted, CircuitPython support for the nRF52840 is still in a very early release stage. Here are a few tips for escaping some of the more common pitfalls. If you're a seasoned Python developer, or really done any Python work at all, you know how critical the terminal can be to tracing-back errors. Luckily a debugging port is built in to CircuitPython too! 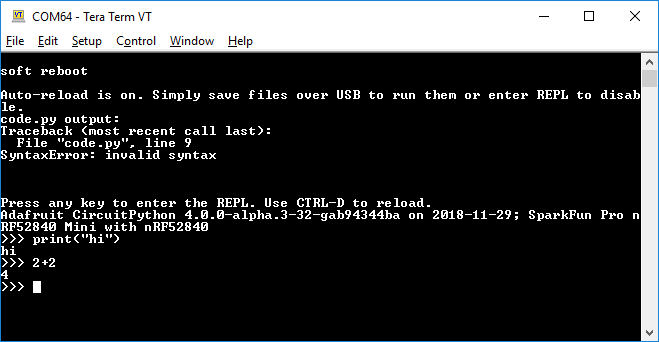 CircuitPython enumerates as a serial port on your computer -- something in the form of COM## for Windows or /dev/tty.usbmodem###### on Mac. Find the port, then open up your favorite serial terminal setting the baud rate to 115200. Follow the instructions above to open your CircuitPython terminal. Then press Enter to enter REPL mode. This will delete all files contained within CircuitPython's filesystem. You should now be able to drag a new code.py on and keep going. For more troubleshooting tips, check out the CircuitPython Troubleshooting Guide. Hopefully that gets you on the right track to developing a truly awe-inspring Arduino or Python-based nRF52840 project. Arduino Core GitHub Repository -- Home base for all of the core source, examples, and tools. adafruit-nrfutil GitHub Repository -- adafruit-nrfutil is the tool required to upload Arduino sketches to your nRF52840 via the bootloader. This is where the source code is stored and developed-upon. CircuitPython API Reference -- Exhaustive documentation hub for all CircuitPython API. CircuitPython GitHub Repository -- Home base for all CircuitPython-related source and tools. Make sure to check out the ports/nrf directory for info specific to the nRF52840. Building CircuitPython Tutorial -- If you want to build a CircuitPython variant of your own, give this a read. If you're looking to take your development to the next level, check out our nRF52840 nRF5 SDK Development Guide. This advanced tutorial documents how to use the nRF5 SDK to build your nRF52840 application in C.